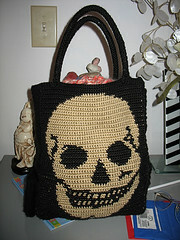 Our beloved CLF Member Copperscaledragon who always have fabulous projects made this bag in 2007. I still love it! It’s totally spookilicous! I’d use it all year round but could you imagine holding this up for treats? Trick or Treat! FILL WITH YARN PLEASE! They would HAVE to do it…This begs to be filled! It’s a free pattern download on Ravlery.com! I love crawling the projects at Ravelry.com. But I do have to say, Hooksters you need to be bold and bolder and post more and more! Make it HARD for me to chose which ones to post! We need more crochet on Ravelry! Are you ready for a VERY TWISTED HALLOWEEN?? Portland, Oregon are you ready for a VERY TWISTED HALLWEEN? Fearless Leader (me…and yes it is wierd to speak of oneself in the third person :)) has arrived, pirate costume in hand, spinning wheel, fleece and hooks galore! Come on down to Twisted on NE Broadway tomorrow Friday October 30th from 5pm – 8pm and help us crochet a GIGANTIC spiders web…and meet what the Crochet Liberation Front has certified as “Possibly the World’s Most Gigantic Usable Hook!” made by our very own Jimbo! Infamous World Traveling Fiber Artist and Activist, Rockpool Candy is joining us all the way from Northern Ireland!!! I’m so excited to meet her LIVE in person! This is going to be one heck of a party folks! Remember October 30th from 5-8pm, and Saturday (Halloween) from 12noon-4pm ! Join us we’ll be spinning and crocheting the web! Check out our famous hooklebrity on Jimbo’s blog! As promised! I’ll posting some of my favorite Halloweeny projects from Ravelry.com. This morning’s offering comes courtesy of AngelaCatrina! 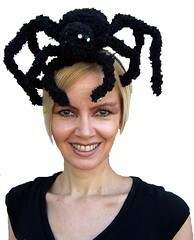 The Along Came a Spider Hat is totally Spookilicious! What an amazing and fun idea! Too much fun! You know me, I’m a sucker for a funkydoodle hat! I was going to post the links to the pattern because they were once available. Sadly this designer no longer has her patterns for sale,and she has wonderful projects in her project page. If she ever does go back up online, I want to know because I will link her greatly creative and funkified patterns here on the blog! Speaking of Halloween… It is 4am I am not in bed yet, because why? I was digging through my “office/room” looking for the hat that goes with my Pirate Outfit. I turned the entire place upside down, and yes, there is mucho mucho yarn and fiber to contend with…I HAD to find it, because the outfit so doesn’t work without the hat! In fact, this hat is beyond special to me, because when I wore in pubic the first time for the CGOA regional in Portland Oregon (Fall ’08), Doris Chan loved my hat! Yes, DORIS CHAN loved my hat! I was most pleased that she noticed the fact that the outfit comes together through the hat. When I designed the outfit, I found that it was lacking something when I put it on. Sure it was cool and the epaulets are a neat touch, but it swamped me small frame. So I made a glorious Chapeau a la Pirate and voila, the whole thing really does becomes one great piece. Panic happened when I could not find me piratey hat…the good news? I had it safely put away where it couldn’t get hurt…Which of course is why I could not find it 😉 Since when do I put stuff away right? Halloween Treat Baskets are totally Kitschalicious! I think these are the cutest baskets! They look like a fun and simple project…so if you are looking for a quick and simple way to make those candy carriers for your little ones special evening (or party favors etc etc) check out this pattern by stormyzcrochet! Stormy’z offers the pattern as a free download on ravelry, or you can see more about the baskets on Stormy’z website! With Halloween just around the corner (next Saturday!) I have been inspired to see what kind of hookalicious goodness is on Ravelry! Check out all the very cool projects and patterns! AMAZING! Which leads me to congratulating Stormy’z Crochet on being the latest recipient of the CLF’s Kitschalicious Award for outstanding kitschy goodness! I’m a sucker for kitsch and you got me right where it counts! LOVE these baskets! Ok folks…Just a reminder I shall be in Portland next weekend for “A Twisted Halloween” at Twisted in Portland Oregon! Come by say hi, get a CLF Postcard and crochet on the giant spider’s web! Meet Rockpool Candy from Northern Ireland, and Jimbo the Fabulous Hook maker! Also in exciting news, I have the CLF First Ever book available for $9.99 on the CLF Website! You can still get it from Lulu, but if you have had problems with them in the past, our site is up and working now. Soon I’ll have more available on the site and you’ll be in like Flynn with Fearless Leader Patterns, CLF stuff and MORE! See you in Portland next weekend!